Compromised accounts and devices are a rising threat for organizations. This series educates your employees about compromises and provides practical information for identifying and mitigating the risks associated with a compromised account or device. Identifying Compromised Accounts - Identify how and why attackers compromise accounts. Learn best practices to avoid the scams associated with a compromised account, such as a business email compromise (BEC). Mitigating Compromised Devices - Identify how and why attackers compromise devices. 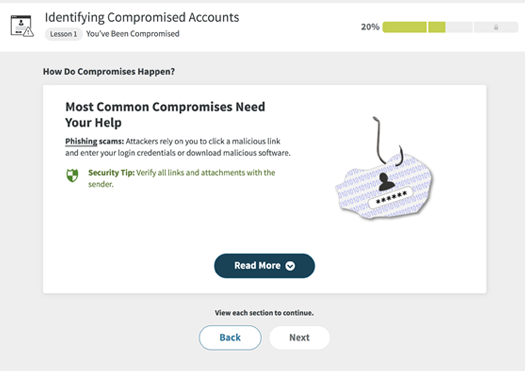 Learn best practices to avoid a compromise or a scam associated with a compromise.